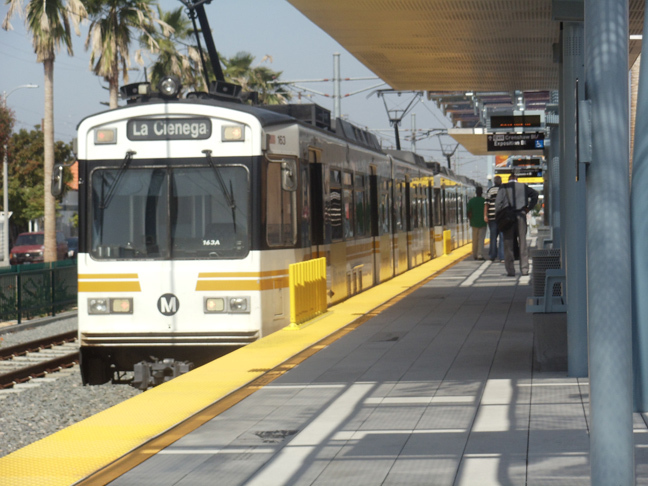 The Metro board of directors is scheduled to vote this morning on whether to move forward with a November ballot measure calling for a half-cent sales-tax hike to raise money for public transit projects and maintenance in Los Angeles County. If the board approves, voters will be asked to increase Los Angeles County’s sales tax by another half-cent, and continue the existing Measure R half-cent tax indefinitely. Metro officials had originally planned to have the proposed tax increase sunset in 40 years — which would have raised $120 billion — but announced earlier this month that they plan to propose a tax without a sunset date. The permanent total one-cent sales tax for transit would create a sustained funding source for construction and operation, and would allow the acceleration of nine projects, including a five-year acceleration in planned improvements on the Orange Line, an eight-year acceleration of the northern extension of the Crenshaw/LAX rail line to Hollywood and a five-year acceleration of the Green Line extension to the Norwalk Metrolink station. Representatives of a coalition of Southeast Los Angeles-area cities are expected urge the Metro board tomorrow to include projects along a six-mile span of Interstate 5 between the 605 and 710 freeways. Downey Mayor Pro Tem Fernando Vasquez will be among the speakers from the I-5 Consortium of Cities Joint Powers Authority, which also includes Commerce, La Mirada, Santa Fe Springs and Norwalk. State lawmakers are asking Metro to delay their vote, saying the public and legislators are not being given enough time to consider the tax plan, the details of which were released on June 10. “Given the concerns raised by numerous stakeholders and the fact that the plan will not be able to be changed or modified for decades, we must ensure it is thoroughly reviewed and meeting the transportation needs of residents throughout all of Los Angeles County,” state Senator Tony Mendoza, D-Artesia, said. Mendoza said the proposed measure fails to live up to what state lawmakers had asked for when they agreed that Metro should put a transit sales tax measure on the ballot. He also pointed to projects that were funded by Measure R that have yet to be completed. “Many of these projects have been postponed for many years and bumped behind others despite the complete lack of project pre-planning done for these projects,” Mendoza said. Senate President Pro Tem Kevin de Leon sent a letter to the Metro board last week asking that the vote be postponed until after the state holds an oversight hearing on the issue that is scheduled for Friday.